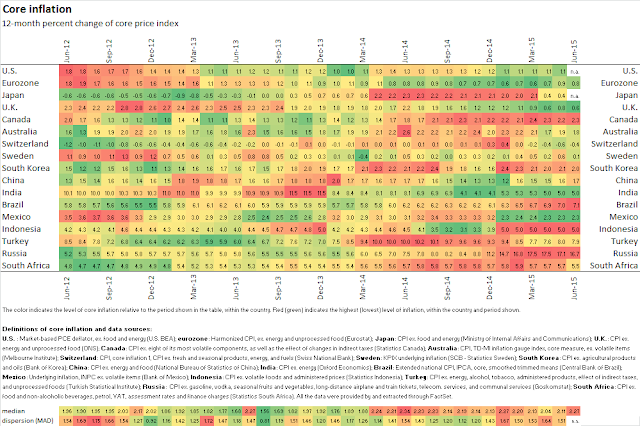 I put together a chart of the 12-month percent change of measures of core inflation for a selection of countries. The definition of core inflation varies across countries. Green (red) means lower (higher) inflation. The color scale is meaningful within rows only. So, for example, the deep-green that the U.K. shows for June 2015 means that the core inflation in that month is among the lowest observed in the U.K. between June 2012 and June 2015 (but not necessarily low across countries; in fact, Switzerland's is lower). The two lines at the bottom, below the legend, show the median core inflation rate and a measure of cross-country dispersion (the median absolute deviation).